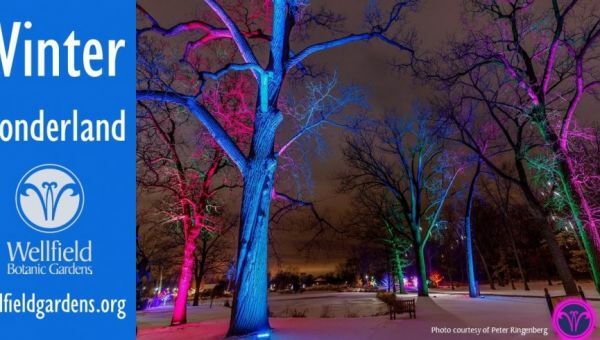 Wellfield Botanic Gardens’ Winter Wonderland Holiday Lights presented by Welch Packaging will transport you to a magical setting of lights, sound and beauty, perfect for families to enjoy during the holiday season. Featuring professional light displays accentuating the natural beauty of Wellfield, the ½-mile Promenade Pathway is aglow with color and texture, framing our Garden spaces as you’ve never seen them before! Experience this new tradition with family and friends as you sip on complimentary hot chocolate while enjoying the sounds of live music performed by local artists around the Promenade. Warm yourself around crackling fire pits stationed around the Garden trails and enjoy a boutique shopping experience in the Visitors Cottage, a great place to pick up that perfect gift. Ticket pricing includes parking, admission to the Gardens, and this very special opportunity to enjoy Wellfield after hours in a wintery paradise. *Please note our November 30 event also includes “Where’s Santa – Holiday Hunt”!